"Try this delicious pretzel crust cheesecake! You'll be glad you did!" To Make Crust: In a medium bowl, combine pretzel crumbs, sugar and butter. Press mixture into the bottom and 1 3/4 inches up the side of a 9 inch springform pan. Bake in preheated oven for about 10 minutes, or until firm and lightly browned. Remove from oven and let cool completely. To Make Filling: Allow cream cheese to reach room temperature. In a large bowl, beat cream cheese until smooth. In a separate bowl, combine pudding mix and milk, then mix in with cream cheese. Beat in lime juice, rum extract and lime and lemon zest. Fold 1/2 of the whipped topping into the mixture, then pour into cooled crust. Cover and refrigerate for at least 8 hours. Garnish with remaining whipped topping, lime zest and slices, if desired. 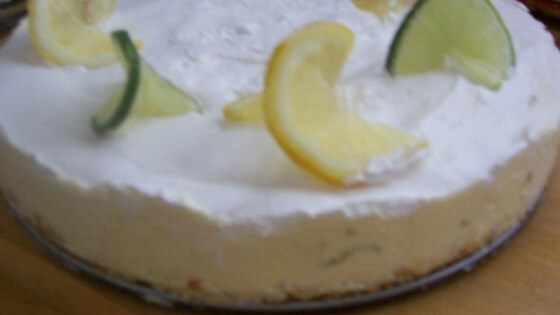 See how to make a classic cheesecake in five easy steps. I wasn't too impressed with this recipe. And I love to try new things, this was not one of them! Sorry! This tasted good but the filling was runny. I'll try again and see if I can thicken it. This pie is easy and delicious! The crust sounds a little strange but it's perfect. Everyone who's tried it has really enjoyed it. Thanks Dana!